Large Format OrganScore book — Standard Note Size — Perfectly Fits the Console. 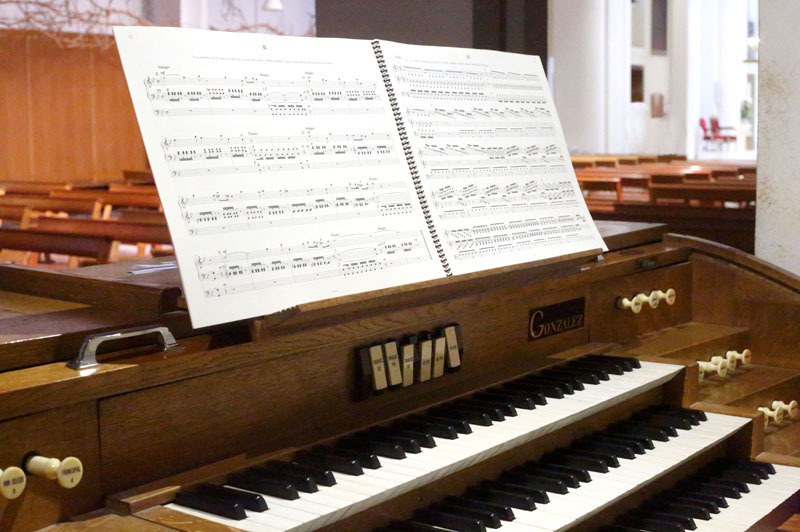 If you are an organist, you very likely perform with your score in front of you, either because you don’t know it by heart, or because the stress of playing in public—on a possibly uncomfortable organ console—can cause memory lapses. That’s why you need organ scores free of page-turning problems. 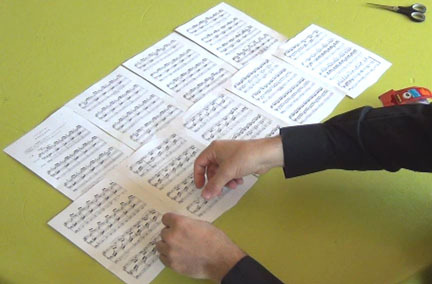 The problem is that sheet music books usually require that pages should be turned several times for one single piece. Another problem is about the binding: how many times have you struggled to keep the page in place once it has (quickly) been flipped ? You play both with your hands and feet, so you can’t use them to operate a potential flipping device. A computer has to be operational (battery loaded) and installed on the organ, which imposes constraints. Operating systems can fail, so that your score may not display with 100% confidence. Digital screens still don’t offer the resolution, surface and visual confort as a large paper score can provide. Because I am an organist myself, I’ve had the idea to put the music on large pages in order to eliminate page turns. The first result was to reduce considerably the number of page turns. Actually, most of the time, I was able to layout the piece on two pages, which meant no page turn. The second result was that it was always possible to select where to place the ‘page turn point’ so that one hand was free to do it very easily. Once this simple and practical idea had sprouted, I applied it for several years whenever I had to edit a new piece for my own needs. It gradually became clear that the idea applied successfully to almost all organ pieces — actually, I haven’t found an organ piece yet for which there is’nt a solution ! 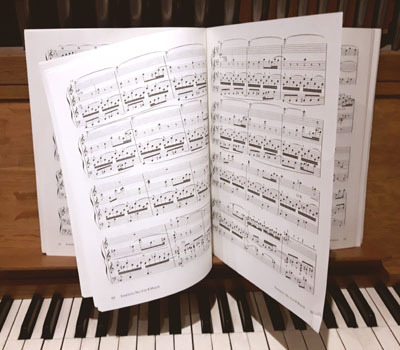 — Hence, I decided to create whole volumes devoted to the repertoire of the organ most commonly played that would systematically solve the page turn problem for organists. Of course, some rather long pieces required time and reflection on the best choice for page turning locations. The size of the notes had to remain remain legible and the choice of the best place where to turn the page could be a dilemma. But after trying different versions and submitting them to organist friends also used to playing in public, I always found an ‘optimal’ solution. Applied to the work of Bach, then Buxtehude, Mendelssohn and others, this approach proved to be really the best solution to layout the music so as to completely eliminate the problem of page turns. And if the piece needs more than two pages, then very easy page turns could be found. 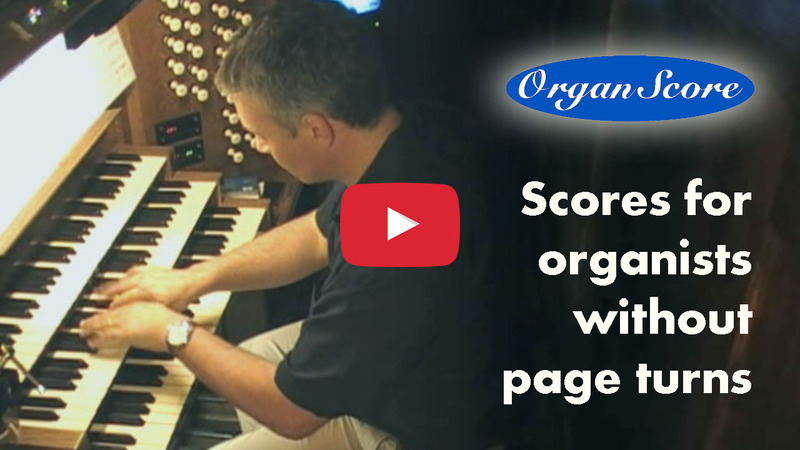 To know more about the OrganScore collection, watch the youtube video and discover how using a large format score is such a great tool for organ performance. When organists stick together photocopies, these are most often reduced in size in order to fit all the music within a constrained surface. Of course, it could have been tempted for OrganScore to also reduce the music size … But No! The edition absolutely has to be just as readable as classical organ or piano editions. This implies that it should respect a staff height of approximately 6.5 mm. This is possible thanks to the large format. Indeed, a reasonable increase in page size provides a large increase in page surface. Hence, the large format OrganScore page surface is about twice that of a standard organ music edition. This allows to lay out many organ pieces on only two pages or at least find easy page turns easily. For more details about OrganScore readability (fonts, staff height, line thickness, spacing and other parameters), please read my article on this topic. For all these stages, the overall vision offered by a score without page turn is a great benefit. I personally have been using large format scores to play the organ for years now, and I could’nt do without them. You can watch on “live videos” how panoramic organ scores allow to concentrate on just playing and not be bothered with turning pages. Just solving for the page turning problem is not the only feature of the OrganScore Edition. A good organ edition should also be practical, long lasting, and have a reliable text. It should also cover the great classics any organist will have the opportunity to play. 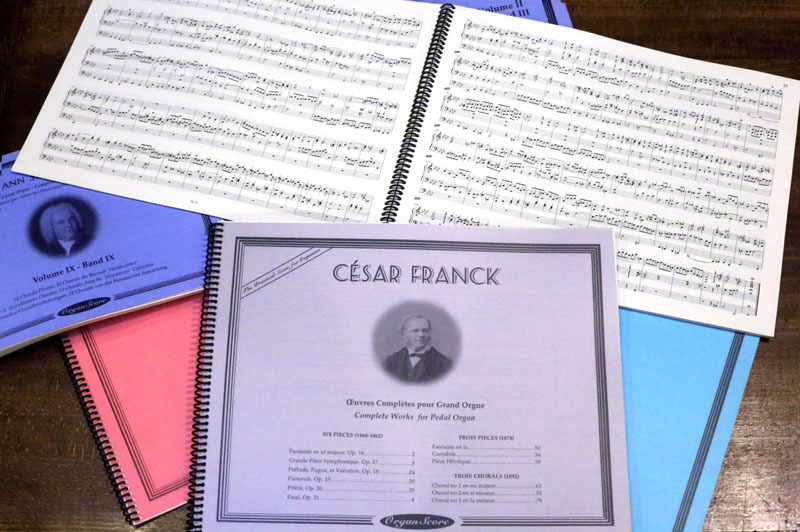 One primary goal of the OrganScore collection is to cover the most popular organ pieces and composers. That’s why that the first release of the of the collection includes a set of complete organ works by unavoidable composers such as Johann Sebatian Bach, Dietrich Buxtehude, César Franck, Johannes Brahms, Felix Mendelssohn. The collection is set to expand and will be completed with new volumes on a regular basis.